The Secretary for the CBCI Office for Education and Culture Fr. Joseph Manipadam SDB, visited North East India On 4th and 5th September 2018 and conducted training and evaluation programmes for Catholic schools. Visiting places like Dibrugarh, Jorhat, Amguri, Dimapur, Diphu, Kohima, Doomduma, Sadia, one cannot but escape feeling sad about the condition of the potholed roads and highways, the frequent power cuts, people still living in small huts, congested dusty slow moving traffic jammed towns… ! But the happy children going enthusiastically to our well maintained and academically excellent Catholic Schools and Colleges awaken in us the only reason for hope and happiness. The Church has not abandoned this region. The Christian missionaries with their compassionate heart imparting quality education have always stood for the poor and the marginalized bringing smile on the faces of thousands of young people and placing a rainbow of hope for the future over thousands of families belonging to this most culturally and linguistically varied colourful ethnic multitude. The Missionaries who planted the sense of God and godliness in their hearts, continue to sustain their hope and dedicate their lives of charity committed to bring them life and livelihood for the future. The visit was to tell these institutions that the Catholic Church appreciates the work done. And below St.Joseph University in Dimapur by DMI Sisters and Don Bosco College in Nagaland. Diphu diocese is in the Karbianglog district of Assam which is probably the poorest and most neglected district of Assam. Some 55 heads of Catholic institutions came for a day’s animation programme conducted by the CBCI Office for Education and Culture. Basically to ensure that we give our best to the last and the least and reach out generously to the poor and the marginalized bringing them value based education and formation of character and convictions. The Bishop of the Diocese, Bishop Paul presided over the programme right through the day and addressed the gathering. The programme was animated by Fr. Joseph Manipadam and Fr. Tommy Palely the Diocesan Education Director. Fr. Manipadam thanked the participants on behalf of the Church for their dedicated service. Kohima diocese is in Nagaland which is mostly Christian and quite neglected hill State. 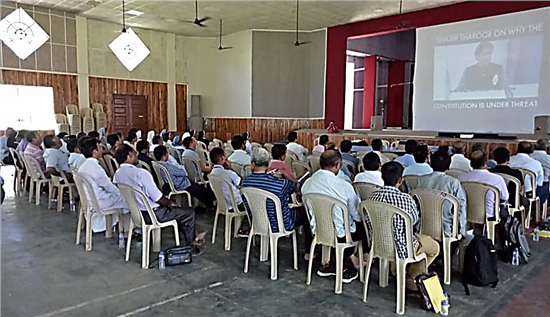 Some 65 heads of Catholic institutions came for a day’s animation programme in Dimapur, the capital of the State. The programme was conducted by the CBCI Office for Education and Culture. The programme was organized to create awareness regarding the many challenges faced in the area of education today and to ensure that we give our best to the tribals and the marginalized and reach out generously to the poor and the differentiated due to language and ethnical differences bringing them value based education and formation of character and convictions. The Bishop of the Diocese, Bishop James Thopil presided over the programme right through the day and addressed the gathering. The programme was animated by Fr. Joseph Manipadam and Fr. Jacob Charlel the Diocesan Education Director. Fr. Manipadam appreciated the dedicated work being done by the participants on behalf of the Church.